It is very often the case that a symptom that shows up as a pain in the back or spine actually has its root cause somewhere else, for example the foot. The horse will very often compensate for the injury by transferring its weight to the other leg, causing twisting and undue stress along the spine. Traditional methods of diagnosis would be to treat the back, give physiotherapy treatment or rest the horse. By doing a thermal scan of the entire body, areas that are showing abnormalities in temperature can be easily identified and the relevant areas of the horse given suitable treatment. This often alleviates the secondary symptoms, in this example the pain in the back. Are you sure your saddle is a correct fit? Is the rider balanced or is the horse moving crooked? Even though your saddle may have originally been fitted to the horse at the time of purchase, as the horse’s body develops and changes through training or gaining or losing muscle or weight, so the fit of the saddle will change. This will affect how the saddle is sitting on a horses back. It goes without saying that an incorrectly fitting saddle will cause discomfort and pain and possibly long term damage. In an ideal world when inspecting a horse, there should be even weight distribution throughout the panels of the saddle to ensure that the saddle is not bridging or sitting to one side, if it has a twisted tree or if the saddle is applying to much pressure at the front or the back of the saddle. A thermal imaging inspection will show the effects of the saddle on the horse’s back, and will also show the effect of the rider’s balance on the saddle. Any areas that are causing uneven or abnormal pressure will be clearly indicated by areas of heat. 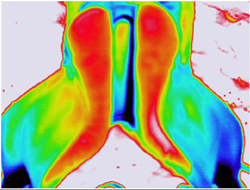 It is also important to combine a thermal imaging scan of the saddle to the shape of the barrel of the horse as sometimes it is apparent that some horses have muscle wastage or an increase in muscle around one scapula and not the other. It is also important to find out if the rider is balanced and sits correctly or sits to one side or possibly suffers with a bad back themselves and are unknowingly compensating while riding.